(Bloomberg) -- Most of the trading volume on the world’s largest cryptocurrency exchanges is questionable, according to a report from a startup that revisits one of the recurring concerns in the decade-old digital-asset market. 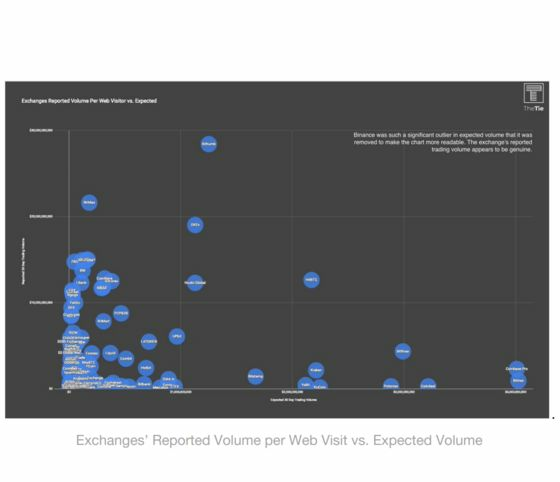 By analyzing internet traffic on the top 100 crypto exchanges’ websites, the Tie determined that 75 percent of the exchanges reported trading volumes that were more than double expected. Nearly 90 percent of the exchanges’ volume was suspect. Website viewership metrics don’t take into account application programming interface or usage of mobile apps, for example, the researchers cautioned. The Tie looked at weighted average trading volume per user visit at leading crypto exchanges Binance, Coinbase Pro, Gemini, Poloniex and Kraken -- about $591 -- and applied the same metric to other exchanges. It found that 59 percent of the exchanges reported trading volume that was 10 times higher than expected. That was especially true at exchanges like BitMax and Lbank, the researchers said. U.S. exchanges and Malta-based Binance, the world’s largest crypto exchange, had expected volume of trades mostly in line with reported, the Tie found. The eight-person New York-based firm, founded in late 2017, provides sentiment analytics, data and other tools to crypto traders. Trading volume manipulation by exchanges has long been a concern of traders and regulators. A variety of activities can artificially boost volume, making it appear that there’s demand for a particular coin when there’s none.